The season gets off to an explosive start with David Cronenberg's acclaimed A History of Violence. 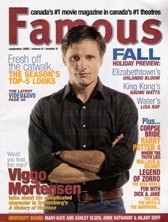 Star Viggo Mortensen talks about painting his character with shades of grey. Some actors possess a certain quality that defines them and their work: Tom Cruise oozes earnestness, George Clooney twitches nonchalance and Viggo Mortensen, well, Mortensen manifests righteousness. You may be thinking, sure, that's the hangover effect from the 46-year-old's portrayal of kingly Aragorn in the Lord of the Rings trilogy. But it's more than that; you get the feeling Viggo Mortensen would do what's right, even if he was playing a really bad guy. Maybe that's what director David Cronenberg was thinking when he cast Mortensen to star in his taut thriller A History of Violence, which was shot in southern Ontario last year, premiered to critical acclain at this spring's Cannes Film Festival and is screening at this month's Toronto International Film Festival. Mortensen plays Tom Stall, a quiet guy who runs a diner in a small American town where he lives with his wife (Maria Bello) and two kids. Laid-back Tom isn't much for talking about his past, but he loses that luxury after killing two thugs who try to rob his diner. His heroic actions earn him a whole lot of press, which leads to the arrival of a sinister man in black (Ed Harris, with a gouged eye) who claims Tom isn't Tom but rather Joey, a killer from Philadelphia who's responsible for said gouged eye. It seems Joey needs to return to Philly and make peace with his older, gangster brother Richie (William Hurt). Tom assures everyone that the whole mess is a case of mistaken identity. But is it? '[Tom] doesn't go from wearing a white hat to a black hat,' says Mortensen on the line from Los Angeles. 'David's hope, like mine, was that his transition would be subtle and that you really couldn't fix exactly when you feel it happens because it's normal for people not to show what they are thinking or feeling. It's not safe to do that. It's just a question of survival, most normal people keep something in reserve and it's probably wise to do so. Mortensen gives a riveting performance, especially since the audience is watching his every gesture, every half-smile, every pleading denial for some sign that will expose the truth about his character. The actor thrives under Cronenberg's sparse directing style, which is less about florid camera movements and gimmicky effects, and more about pointing a camera at the actors and letting them tell the story. Even the violent scenes - and there are a few explosive moments - are not meant to entertain. 'Violence in movies, even if it's shown to be really bloody, has a layer of gelatin or sugar over everything - whether it's shot in slow motion or looks pretty in some way,' says Mortensen. Mortensen says that in some ways it's like the 1952 Gary Cooper western High Noon, about a town Marshal who's abandoned by his friends and family when he decides to stand up to a criminal out to kill him. He may not think of himself as being in the same league as Cooper, but Mortensen credits Cronenberg with bringing out the best of his acting abilities. 'I had a running joke with the crew of the movie "cause I'm a Canadiens fan,' he says with a hint of glee. 'I was raised in northern New York on the St. Lawrence across the river from Kingston and I always liked Montreal. I made the mistake one day of wearing a Montreal T-shirt. The crew said "Holy sh-t, whatya doing!' And then I realized, God, these guys are wearing f-ckin' Maple Leafs caps every f-ckin' day. 'So every Thursday I didn't just wear a Montreal T-shirt, I wore a red Montreal hockey jersey,' Mortensen says laughing. It's striking to hear the serious-minded actor laugh. The man who, in addition to acting, paints, tales photos, writes poetry and helps raise a teenage son (Henry from his now-defunct marriage to punk rock diva Exene Cervenka), admits he's burnt out. After finishing the LotR trilogy he traveled around the globe to shoot the period horseracing flick Hidalgo, then did A History of Violence and he's just returned from Spain where he completed the 17th-century historical action pic Alatriste. The man needs a rest. 'I've been away for quite a while so there are a lot of pieces to pick up and there are a lot of things I haven't dealt with, in terms of family, in terms of other interests as well - photography, painting, writing,' admits Mortensen. But what if a great part comes along? 'But that's the way it is with temptation,' he explains. 'When you really feel you need something, a certain job, it's a desert out there. And when you make a decision, like I've been away too long, I've been blowing off a lot of things, I've used up a lot of energy and I've got to recharge my batteries - just when you say that, all of a sudden you are being sent stories that are the best thing you've ever read.